The design of the cutting rolls and moulding rolls and dies for deposited cookies determine the pattern of dough pieces on the oven band. 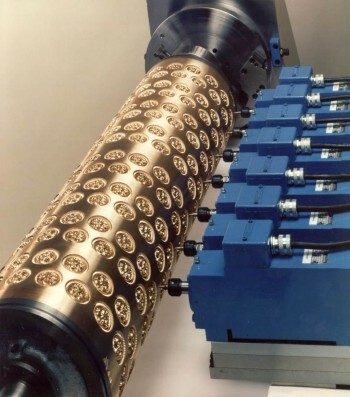 The cutting and moulding rolls are designed to give the maximum number of dough pieces per square metre of oven band. In the design of dies for cookies, allowance is made for the spread of the dough on the oven band during baking.Normally the rolls are designed to provide a separation of about 8-10mm between the edges of the biscuits on the oven band. The distance between dough pieces must also allow a sufficiently strong scrap dough lattice to be lifted without breakage after the cutter for cut biscuits. Rectangular biscuits are baked with the short edge leading, which aids control during cooling, stacking and feeding to the packaging machines. Round biscuits may be “nested” to gain the maximum loading on the oven band. Hard sweet and cracker biscuits are produced from a continuous sheet of dough. The biscuit shape is cut, printed and perforated before being deposited (panned) onto the oven band. Most products are cut into separate individual dough pieces before baking. The scrap dough around the dough pieces is recovered after the dough pieces are cut and returned to the sheeting machine at the start of the forming process. Some products, notably soda crackers and some snack crackers are baked in a continuous sheet. The dough sheet is perforated so that it can be easily and automatically broken after baking into the individual biscuits. When products are presented to the oven as a large sheet, there are several considerations. The edges of the sheet at each side will pick up more heat from the edges of the band, which are not covered by the dough. The edge biscuits will therefore have more colour and this can be excessive. Oven band screens are used on some oven designs which deflect hot air away from the band edges. These are adjustable and will reduce the movement of hot air at the band edge and hence reduce the colour of the edge biscuits. In severe cases the biscuits may be baked with edge scrap dough which is removed after baking. Alternatively steps may sometimes be taken to reduce the temperature of the band edges by forced cooling. Cracker dough sheets usually shrink during baking and this can cause random breaks at the perforations on the edge of individual biscuits. These random breaks cause problems after baking at the automatic breakers as the biscuit sheets are presented irregularly. 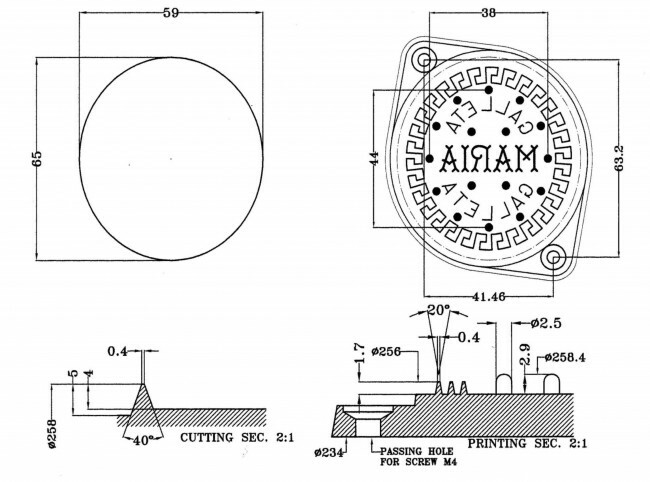 It is therefore worthwhile to reduce the size of the dough sheets and these may be cut through at approximately 1.0m length by a large diameter cutting roll (approximately 320mm in diameter). Alternatively the crackers may be cut and baked in strips. Most moulded and deposited cookies are formed and baked individually. Some extruded products, such as filled bars may be baked in continuous “ropes” and cut after baking. Layer cakes are baked in continuous sheets and slit and cut after baking. During baking, biscuits and crackers expand and lift to form a light open texture. During this process, rapid expansion of water vapour in the dough pieces occurs and the vapour needs to be released. 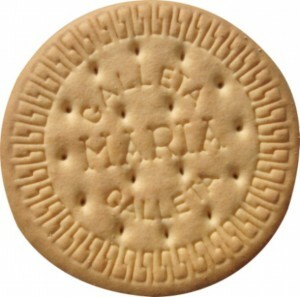 This is accomplished by a series of holes in the biscuit design, called docker holes. The docker holes are placed in the design to release the vapour evenly and maintain a flat surface and even thickness of the biscuit. This accurate control of flatness and thickness is essential to the successful automatic packaging of the biscuits. The band loading (weight of dough pieces on the oven band) will vary considerably depending on the biscuit design, band layout, biscuit weight, water content in the dough. The loading will influence the design of the oven band supports, drive and tracking system. Usually the oven is the critical item in determining the capacity of a complete biscuit line. Other considerations are mixing capacity, forming machine speeds, cooling and packing capacity, these are usually specified to suit the oven capacity. The output of biscuits from an oven is determined by the baking time and the oven size. To determine the output from an oven, we calculate the number of biscuits across the width of the oven band and multiply this by the number of biscuits contained in the length of the oven. This gives the total number of biscuits contained on the oven band during baking. We divide this by the baking time in minutes and this gives the total of biscuits which will be baked in one minute. The output is usually expressed as the number of biscuits baked in one minute, or in kg of biscuits baked in one hour. The cutting and moulding rolls are designed to provide the optimum oven band loading. Consideration is given to the spacing between dough pieces on the band, the spread of cookies during baking and the orientation for the cooling and packing. Some products such as soda crackers and snack crackers can be baked in a continuous sheet. Care must be taken to avoid excessive edge colour and irregular breakage of the dough sheet in the oven. Docker pins are used to create holes in the dough pieces to allow the escape of water vapour and to control the surface form of the biscuit, giving a regular flat surface with even blisters on crackers and hard sweet biscuits. Biscuit output from the production line is usually determined by the size of the oven. The output is calculated from the biscuit size and weight, oven loading, oven band width, length of the baking chamber and the baking time. Manley D. Biscuit, cracker and cookie recipes for the food industry. Woodhead Publishing Ltd.2001.